Once a jungle territory of the British Province, Giridih later on became a province under Hazaribagh and was finally separated as a district in 1972. Giridih literally means land of hills and it is true as it inhabits a major region of the plateau of central India along with the nearby plain lands. Giridih is commercially viable to coal miners and granite collectors. The place inhabits a wide range of rugged topography that comprises of huge granite hills to small undulating plains. The forested area is well covered mainly by sal trees. The rugged topography is also seen in the form of little waterfalls that erode the rocks underneath to beautifully carve out of small spaces and then gush to the river. Summers in Giridih are hot and dry. It would be better to avoid the visit in summer without proper protection, as the entire road route passes through the red soil areas which heat up the atmosphere nearby. However, local vegetation provides some relief during your halt. Winters are the best time to visit. The climate is cool during the day with a lot of sunlight. The nights get chilly so make sure to carry some extra pair of warm woollens. The distance between Kolkata to Giridih is roughly 320 km and is accessible via all transport routes. The road route journey from Kolkata is spectacular as it passes to some of the historically conserved towns to remotely located villages along the highway. Route 2 is a longer route of about 385 km; however, this route passes through some of the historically conserved places of Bengal. Therefore, it is the recommended route. The route also encompasses massive greenery along with hill topography, which gives a scenic view throughout the journey. Also known as the Royal Heritage City of West Bengal, Bardhaman has been an important city since the ancient period. Ranging from invasions to stories of heroic freedom fighters, Bardhaman preserves its history in the silence of its location. The city is commercially less exploited, peaceful and throws a marvellous insight into the pages of history. The shrine of Sarvamangala and the 108 Shiva Temple are fine examples of Bengal architecture, famous for the use of terracotta. This unique blend is nowhere found in India. The Golapbag is the garden of roses. It is a famous tourist spot for a short stay, where you can relax and explore the beautiful botanical displays. The Hawa Mahal and the tomb of Sher Afghan are worth visiting and are located near Golapbag. Bardhaman also has a small wildlife sanctuary called the Ramana Bagan. It is known for its birds, crocodiles and beautiful trees. 60 km from Bardhaman lies the pious and serene village of Santiniketan. The place is associated with Rabindranath Tagore. Santiniketan is known for its cultural importance and Swadeshi movement. The entire place is beautiful with greenery sprawling its entire length. A deer park is located at Santiniketan and the place is well conserved in its ecological beauty. Sonajhuri is another tourist spot. The red soil, eucalyptus trees and the eroded land deliver a spectacular beauty. There is a great abundance of Sonajhuri trees all over the area which is best to explore while driving through. Santiniketan is also known for its baul (folk song) culture, local handicraft market and traditional Bengali food. Dumka is the oldest district of Jharkhand. It is 107 km from Santiniketan. The place has earned a reputed name in history for the Santhal Hool rebellion. The Santhal tribal people are the major inhabitants who still preserve the natural beauty of the place along with their cultural heritage. Massanjore Dam is a famous place to visit in Dumka. The gorgeous Tilpara Barrage or the Canada Dam is located on the Mayurakshi river. The dam is surrounded by hills and forests which give a picturesque image of the scenery. It is a perfect place for family outings. Giridih is 121 km from Dumka. The entire journey from Dumka to Giridih offers spectacular sites of green patches with isolated yet continuous hills. Giridih is also divided into two main water heads, the Barakar and the Usri rivers. Granite hills are most common in Giridih and some of the famous religious sites are located on these hills. Travelling to Giridih is also an adventurous experience for its rough trekking and hill climbing. The 40-feet-high falls divided into three major streams offer a spectacular site to travellers. The falls is surrounded by the famous Parasnath Hill. The falls is located amidst a small forest area known for nilgai and wild chital. The granite bedrocks cut through the narrow veins of erodible rocks, giving the site a magnificent gorge-like appearance. The Khandoli Dam is located nearby which is another tourist spot. 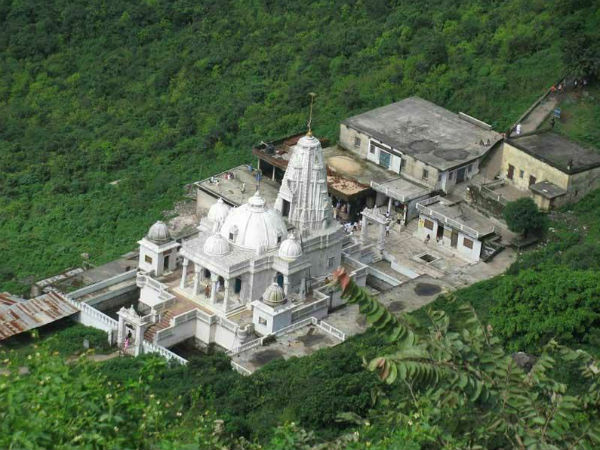 The famous Jain temple is located on the Parasnath Hill, the highest point of Jharkhand. The place is believed to be the site where all the 24 Jain tirthankaras attained Moksha. The pilgrimage is a round trip of 24 km through the beautiful Madhuban forest. The area has to be trekked to reach its top. Numerous temples are located along the path to the main temple. The Shikharji Temple depicts mural paintings which are conserved till date. Located towards the Bengabad block, the dam is a scenic water reservoir. The government has developed it into a major tourist destination. Birdwatching and adventure sports have become popular in the recent days. There is a watchtower nearby located on a 600-feet-high hillock offering a panoramic view of the entire Khandoli Dam. The amusement facilities include rock climbing, boating, kayaking and parasailing.